Discussion in 'Works In Progress' started by alexanderameye, Mar 8, 2017. I've built a new beta version (V1.1.0b5) that is available now! Send me an email with your invoice number if you'd like to try it out. edit: I am also figuring out what to do with rotation based doors. I want the whole system to make sense. This means I'll be doing some re-organizing of the system. I'll also be taking a look at future features and how I want to implement those and develop the tool right now with those in mind, so I don't run into problems when I want to implement them in the future. Hello, this will be the last feature update for a while since most of the features for V1.1 have been added and the next few weeks will be mainly bug fixing, testing, refactoring and making small improvements! Now let's get to the update. In V1.1 I will be adding swing doors or location based doors. These are a type of doors that are used in many many games. Basically the door can move into 2 directions depending on which side of the door you're on. This is just a proof of concept right now, there is still some testing and bug fixing to do. Right now you can use swing doors by selecting them in the rotation type enum. Doing this will spawn 2 trigger zones just like when you are using looped rotations. You'll have a front trigger and a back trigger. You'll also find 3 new angle fields in a rotation block. Here is the feature currently in action. Please note that the whole GUI and everything about swing doors is still in early testing so things will change, but hopefully you get an idea of how useful this feature is. edit: the video doesn't seem to show up in the post so I uploaded it to YouTube. update: I have changed the behavior of the swing doors. They now work similar to the doors that you can find in the games PUBG, Fortnite and Dishonored. next up: the new demo scene! Nice intuitive system. I would vote for 20-25$ as well. I prefer not buying underpriced assets, so I know there will be no issues with future support due to financial reasons. So many things are way underpriced in the Asset Store. Thank you! I totally agree with you. Personally this is a pure passion project so if I keep enjoying working on it, I will continue to develop it. I really love this system I created and adding features and improving it brings me tons of joy. This is a great asset. Buying now. I had forgotten about it but we need a door system with player tags so it is perfect! Thank you so much for the support Teila! If you send me an email with your invoice number, I'll send you a custom beta version if you'd like that! Using the beta version instead of V1.0 might spare you of some small issues when you try to update from V1.0 to V1.1 once it's released on the asset store. I changed the script organization, combined scripts and removed others and I'm still trying to figure out how to properly make the system easy to update without causing headaches to my customers. Plus, the new speed system is much much better than V1.0. Hello! I guess this week's update is a bit less flashy, and I don't really enjoy working on it, but it's still very important! With V1.1 I will be completely rewriting the documentation for the tool and I'll be migrating the content to github pages. By hosting them on a website, I can add changes to the docs on the fly and keep them up to date. This new documentation is meant to be easy to navigate and contain all the information you need! Here is an initial version how the new docs will look. I just started creating these docs so most of it will change. I do like the current theme though. I'd like to give one more update for this week. I've added the option to have an 'is Object' requirement in the trigger script. This condition will check whether or not a certain gameobject is in the trigger zone. This is useful when you're maybe creating a puzzle type of game. Here is the new feature in action. I've also worked on the documentation a bit more. It is coming together nicely. I'll be doing some refactoring this evening and will build beta V1.1.0b6 soon. After this I'll be focusing on creating promotional imagery, videos etc. Have a nice weekend and a nice week! Hello everybody, I'd like to announce that Alex's Door System/Doors Pro will be on sale from November 27th until December 8th. The discount will be 20% off so 7.99$ instead of 9.99$! With version V1.1 almost done, this is a great moment to pick up the tool. If you have purchased the tool, email me at alexanderameye@gmail.com to get a copy of V1.1! Sales are great! I already bought it and worth the price. Yeah, it's my first sale ever as a publisher. I'm pretty excited! I'm glad you like the asset, if I can be of any assistance, let me know! No webGL demo and no video showcasing all the features make this a no go. I can imagine! The promotional stuff for V1.0.0 wasn't that great to be honest. Ideally I should have included a demo and a tutorial video for sure. I am adding these in the future! Thank you for checking out the thread! Hello! So here I am again with another update regarding version 1.1.0. In terms of features I have finished the swing doors system. For the rest I've been busy polishing the whole asset, adding little tweaks and cleaning up all the scripts. I've added icons to some of the scripts so that they are easy to recognize. 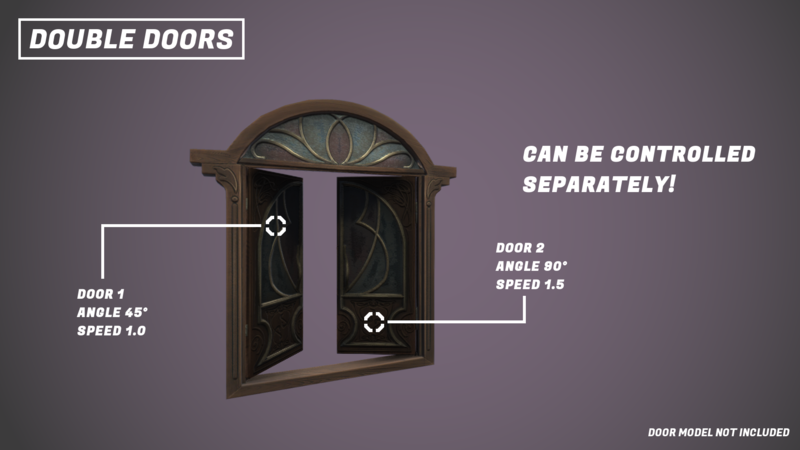 Now your doors are immediately recognizable in your scene. I've redone the icons from the Rotation Timeline. And subtle version numbers on every script. I've created a changelog window. And I've redone the icons for the support window. I've also created a preferences entry for the door system. As you can see, all these changes are very small but they do add up in creating a pleasant customer experience. I still have to finish the documentation, create a demo scene, clean up more scripts, polish a bit further and create a tutorial video. There seems like I'm almost ready, but it's these small things that take up a lot of time since I tend to spend a lot of time making sure everything is just as I want it. I will be building V1.1.0rc1 soon. Hey! I'd like to let you know what the plan is for the coming months. For the next few weeks (until the end of January) I won't be working on the system because of irl responsibilities. V1.1.0 is completely done in terms of the actual package, there is just some more work to do on the demo scene and the promotional images. V1.1.0 is set to release in February. After the V1.1.0 update, I will start working on V1.1.1 that will contain focus on adding a debug mode with angle visualizations, new trigger zone visuals etc. More info on this later. Enjoy your holidays and have a nice start of 2018!! Hamesh81 and Bartolomeus755 like this. Hello! I'd thought I update you guys on the progress of V1.1.0. Even though I'm dealing with some personal issues right now, the update is still scheduled for February (or at least the submission). Today I started finishing up the asset for the update and as a last new 'feature' I've created an 'error detection' tool that will let you know if you've set up everything correctly. That way you can catch possible errors before even hitting play. In the following days, I will create a demo scene, improve the player prefab, organize the folder structure and create some promotional imagery. After that it's ready for release. Thank you for your patience, I am really excited about this update and the future of this asset! Update: I've finished creating all of the promotional imagery and cleaned up the asset. Now I only have to create a demo scene showcasing the asset's abilities and I'll be done. I have just submitted the update for review! Hopefully it will be accepted soon. manpower13 and Bartolomeus755 like this. The documentation is not yet completely and will be updated in the coming days. Thank you for supporting the asset! Note: If you are already using Doors Pro in one of your projects. I strongly recommend deleting Doors Pro from that project before importing the new update from the store. You will have to need to redo the set up of your doors but this should be fairly quickly. Yes you definitely can! You can make it so that the player needs a certain script/name/tag or you can make it a requirement for the player to be looking at an object! Multiple ways to 'lock' the door, I hope that helps you out. Here there is more information about the locking-component! In the next update I'll be changing the look of the trigger zones to make them more visually appealing. Here are some early tests. I will also change the way trigger zones work so you'll be able to make trigger zones out of any shape. I've added an option to 'preview' the audio clips for the door's rotations so that you don't have to hit play mode every time you want to tweak a value. More improvements to the sound component will follow! Teila, rrahim and Bartolomeus755 like this. You seem to think of everything! Great job! Thank you! Using the tool myself really does help with things like these. Tons (really) of improvements and new features are coming, I have Trello boards full of them! In V1.2 I will add support to these 2 assets. You can toggle on support for them in the new preferences window that's coming in the next update. There are also buttons that will take you to the store pages. You'll find new entries in the player requirement tab where you can make it so that a lock has to be unlocked in order for the rotation to take place. I decided to not create any kind of lock system myself right now since there are already good solutions available on the store. Maybe in the future I will create padlock/keypad systems myself, but for now this is the solution I am proposing. How compatible is this Asset with 3D Forge Assets External and Internal Village Kits? Hey! So I have tested out the asset with the free packs made by 3DForge and they all work perfectly. All of the pivot points of the doors in those kits have been nicely positioned. You'll have to toggle the 'correctly positioned' option in my asset and you're good to go! Edit: Also make sure that the doors aren't marked as 'static'. Thanks. Will give it a whirl. So I've been a bit quiet for the past month. Mainly because I'm just very busy and this will stay the same for the coming weeks. I have continued working on the V1.2 update here and there and I'd like to fill you in with what's left to do and also what's coming in V1.3. So first the features that are coming with V1.2 that are already done. 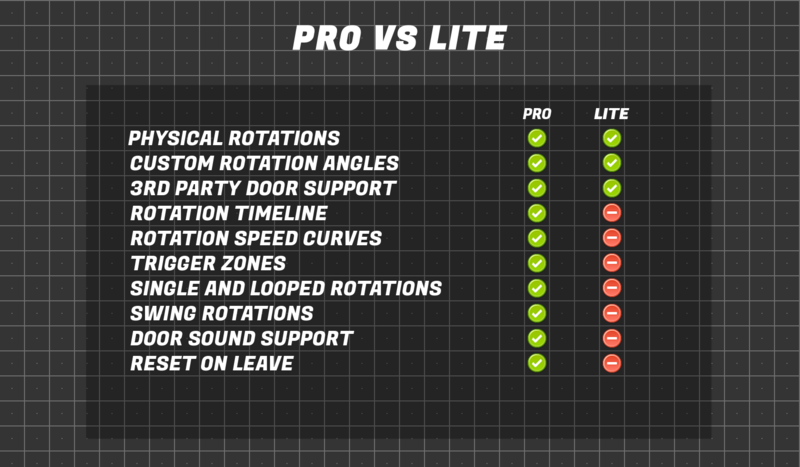 I'm currently working on these features, if they are done I will publish the V1.2 update. I've been working on a new demo scene that's more like an 'actual level'. I've never created any 3D models so this is very exciting stuff to do. The design will be very basic, I won't be doing any texturing but hopefully it will have a cool minimalistic look that can show off all of the functionality of the asset. Here are some screenshots of the work-in-progress! I'm also working on other projects so progress on the updated might be slow. Currently the update is planned to be released in July with V1.3 following in the fall of 2018. Currently these features are planned for V1.3. This list will probably change a lot but this is what I'm planning to do. Thank you for purchasing and reviewing the asset, I appreciate it a lot! Important: Currently there is a bug in V1.1.0 where the sound component doesn't work when using single/swing rotations. To fix this, email me at alexanderameye@gmail.com with your invoice number and I'll send you new files that fix the issue. I just pushed an update to the store that fixes the audio bug in V1.1.0. I also completed the documentation files for the Doors+ asset. The new docs should be up soon. This V1.1.1 update also pushes the required Unity version to Unity 5.6.6 which is the last update to the 5.x cycle. Thank you for the support. I'm looking forward to the V1.2.0 launch in July! Based on some feedback I'm also re-doing the promotional imagery for the asset. Here are some initial tests. Please note that this is extremely early and will of course change. In V1.2.0 I'll be adding more rotation curves to the asset in the form of presets. 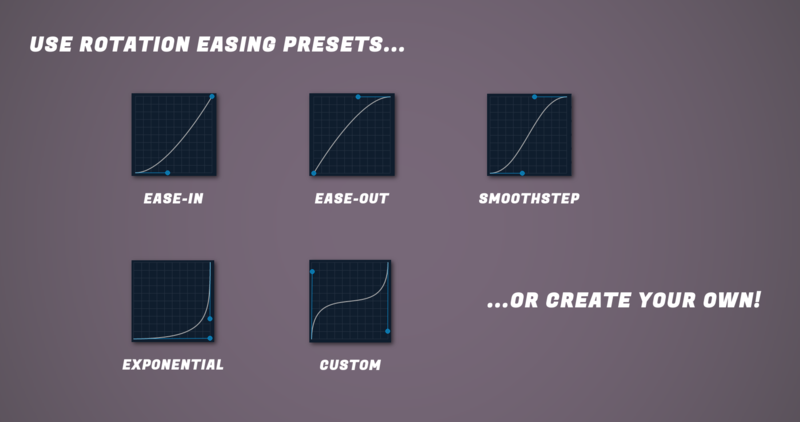 From now on you can select on of these curve presets that the rotation will follow. You have an enum where you can pick the rotation curve. When you pick the 'custom' option, an animation curve will appear where you can set a custom graph. This feature will help you to pick a nice rotation curve a little bit faster than always setting it. This way you also get accurate curves instead of trying to approximate a smoothstep curve by dragging curve keys. As seen in the video below, the rotation curve determines how the door behaves during the duration. The times at which the doors are fully opened/closed will stay the same even if you change the curve. If you want to change those times you need to change the speed of the door. The video below shows that the 2 doors open and close at the same time, but one of the doors rotates a bit faster in the end than the other. I've added icons in the hierarchy so you can easily see where your doors/trigger zones are located in a sometimes cluttered hierarchy. You can toggle this option on/off in the preferences. 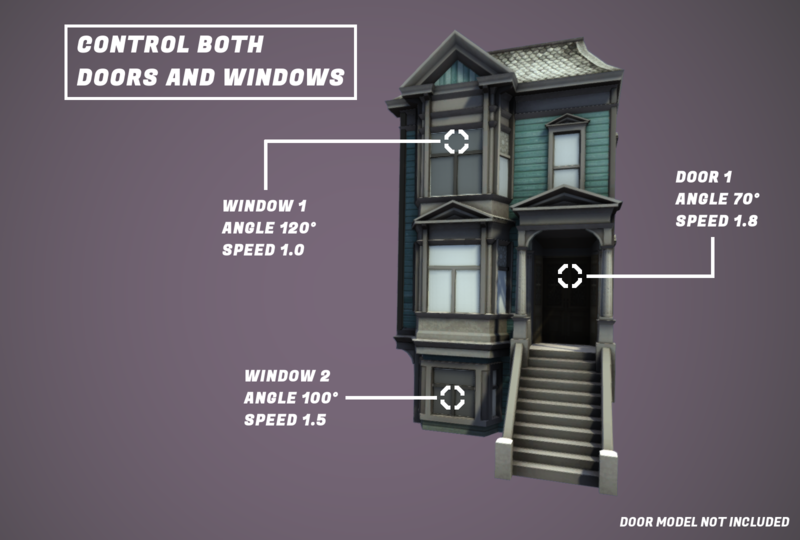 ehi man ..i love your door asset but how much time do you expect t update 1.3 is live since i rellay need all cool features it offer..
V1.2.0 will be live before the end of July and will have these features. I'm not set on the features for V1.3.0 yet but right now I'm planning on adding these features. I'll start working on these features after V1.2.0 has been released and I hope the update will be live before the end of 2018. If you have features you'd really like to see added, let me know and I'll see if I can add them in V1.2.0! Otherwise they'll be for V1.3.0 but I'll make sure to focus on them first so I can get you a beta version before the actual update. What features specifically would you like? but the end of the year it's really too late since I'm kickstarting my project this summer.. I'm working at the core of player now but almost finished all basi features( movement system, health system,weapon system, simple parkour climbimg system) and now i'm Moving on inventory and crafing system and event system.. I'm a busy student so pushing all of these features in the V1.2.0 is not possible However if you need assistance with implementing any of these features yourself, feel free to email me and I'll let you know how I planned to create those features in the asset. For the lock picking I was planning on supporting this asset. But this could change since there are many more lockpicking tools on the store that seem great. I think that with a bit of custom coding you could for sure add in support yourself for an asset like this. For the delay blocks I was just going to add a new type of rotation block that had a float field in it that lets you set the delay in seconds. Then if the game is playing and it sees a delay block, it will just play a timer using a coroutine and then go on to the other blocks of the rotation once the delay is completed. I could take a look at this at the beginning of July and see if I can push it in the V1.2.0 update. I can also send you a beta of the V1.2.0 update at the beginning of July if you'd like. The peeking system, rotation on 4 sides and the trigger zone combination systems are harder since I haven't looked into how I want to implement them. Peeking system will possibly be another component added to the door (just like the rotation component and the audio component). I will then use a 'peeking trigger zone' and when the player is standing in that zone, the player can open the door for a maximum of x degrees using the scroll wheel or some other input. The trigger zone combination system also requires some thought. I will probably add a button called 'link another trigger' under the 'add open trigger' button that creates another trigger zone that then gets linked to the current trigger zone. After that when rotating the script will check whether or not the trigger zone has linked zones and check all those linked zones if their requirements are met. 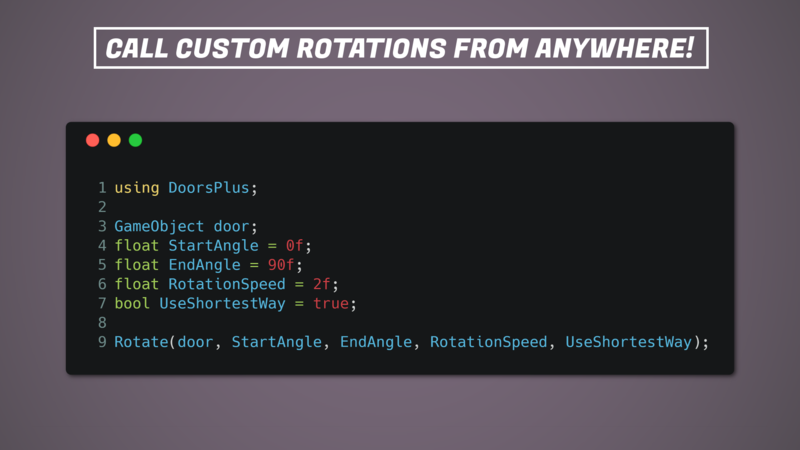 Rotations on 4 sides is not that hard but it's just a lot of work to create a clean, bug-free implementation for it. With all the things I have going on, finals, studying, other projects, real-life obligations, it's not possible for me to put in all of these features that fast. Thank you for understanding! So right now I can promise you that I'll send you a beta version of V1.2.0 at the beginning of July and that I'll be looking at delay blocks in V1.2.0 and that I'll put them in that update instead of the V1.3.0 update if they are not that hard to implement. thanks again for your reply...and for your time... i see you are very passionate for your asset btw i'm going to purchase ti nxt few days since even in this state ithink it it's a great asset and with future updates I'm sure it will be better..
Hey! So this is probably one of the last updates before the v1.2.0 release. All of the features I want to add in V1.2.0 are now done and I just have to make some promotional artwork and demo scenes. Because I really wanted to release the V1.2.0 update in July and I have some personal things going on, I'm going to push back the support for padlock and keypads to an update in August (V1.2.1). I would also like to show you a gif of how easy it actually is to get a working door in your game! There is an offset on the mouse position but you should get the idea. I got a great door in about 20 seconds! Support is not yet added. I still have exams until the end of June so until then I won't be able to add in the support. Support for these assets will not be live in V1.2.0 that I'll be releasing early July, but I'm going to publish a version V1.2.1 (hopefully) later in July. that will add the support for them. However, tomorrow I'll see if I can send you a beta version of V1.2.0 and try to walk you through the set up to make the asset work. Could you send me an email at alexanderameye@gmail.com with your invoice number so that I can send you the beta version tomorrow? Also, here is an initial test I did to show the 2 assets working together. hi again I'm going to purchase now.. but i woudl to ask if is there a key door system mechains is your asset since i dont remember if there is one.. and i door can be controler even from button to simualte doors opened form ocontrol rooms ect.. There is a key system in the sense that you can make it so that a door will only open when the player has a certain script on him. So you could create a script called 'Key' and give it to the player somewhere in your game and then set that script to be a requirement for the door. As seen in the UI below, just toggle the 'script' option and drag in the script that you would like to use as a key. You can also use buttons to control doors! Just create the button you'd like to use and toggle the 'looking at' option on script as seen in the UI above. Then drag in the button object. This will make it so that the player has to be looking at the button or lever in order to open the door. You can combine this with a 'pressed' requirement so that the player has to look at the button and press 'e' in order for the door to open. thanks again for your time and effort..
i'm going to purchase hope i can be able to use the asset and cant wait for future updates and and integration like peek system , padlock and keypad integration, delay blocks ect..
Great! If you run into any issues or if you would like to use the V1.2.0 beta, send me an email. Also be sure to check out the documentation. Also in case the UI didn't show up right, here is another picture. Hey! So this will be the last status update before the actual release. I'm currently working on promotional artwork and fixing some final bugs. I'm also creating a demo scene. I already did some decent work on the promotional imagery, the demo scene is taking up a bit more time. I'm going on a holiday so the release of V1.2 will probably around mid July. Here is already some artwork that I did (WIP). I'm pretty happy with how it's looking. I also have to write some more stuff in the documentation but that won't take too long.